Updated 15th May - see here for latest update. Whilst round at my parents house I came across this book which belonged to my dad. I hadn't seen this book for a long time and I knew it contained some excellent pictures of how the route through Tiviot Dale Station used to look. I will make references to the pages of this book, so you too can see how the line used to look. I will mark the pages in red. 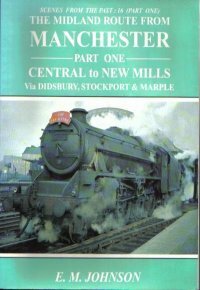 I think this book is still in publication, its by the excellent E.M. Johnson, who has completed other books about the railways of South Manchester. Published by FoxLine with an ISBN of 1-870119-20-7. I recommend this book. 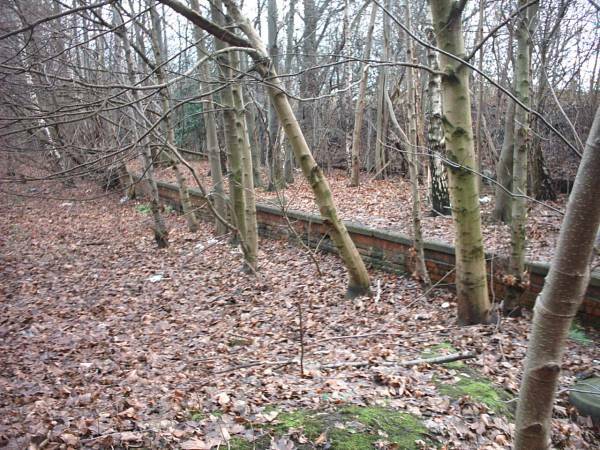 This part of the site was inspired by Nick Catfords excellent website about closed and disused railway stations. 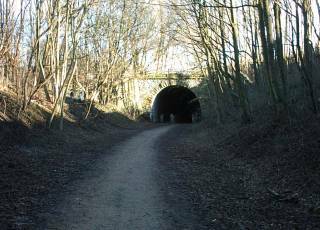 I came across his site while looking for information about disused railway lines / cycle routes. 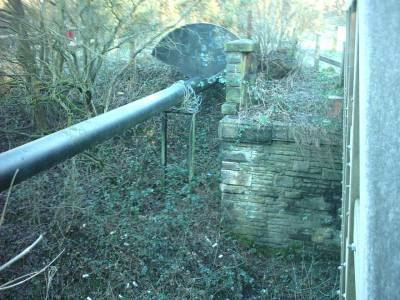 The site is dedicated to closed and disused railway stations across the UK. There are details and pictures of sites as they were and as they are today (or recently). One of the latest stations Nick has added is Tiviot Dale in Stockport. As it is not very far away I decided to take a look at the site when I dropped my Girlfriend off at work. This isn't a bike route, but I will look at the line in more detail in the future, as there are parts which are still rideable and enjoyable, as it runs through the Mersey Valley. There is a lot of industrial heritage to be found on this old route, and I look forward to riding it soon. Anyway - back to the station. 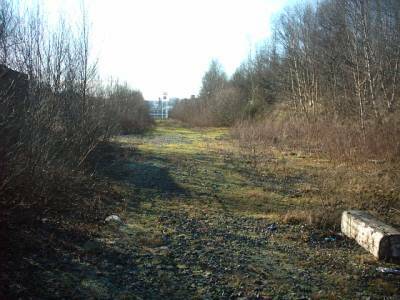 Below is a collection of pictures I took of the old station site in December 2004. Its fascinating to see what is left of the site. This is the present view of the station. 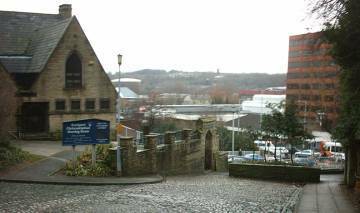 I took a walk down Lancashire Hill and then off down the steep bank to the old station site. 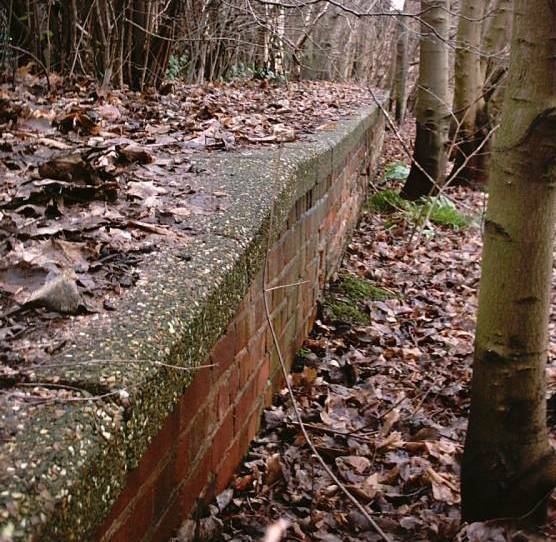 As you can see part of the platform edge is still in situ. I think this was a secondary platform, which was a dead end. The main through platforms have since been filled in. This is a view of the main station site. As you can see it has been completely filled in. 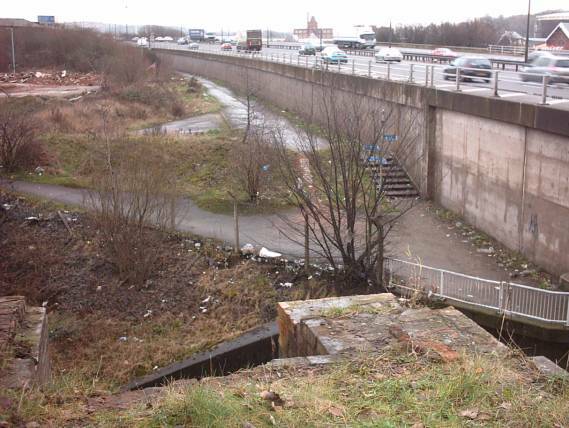 The M60 motorway was built on the left hand side, and now takes up the the place where the main station used to be. 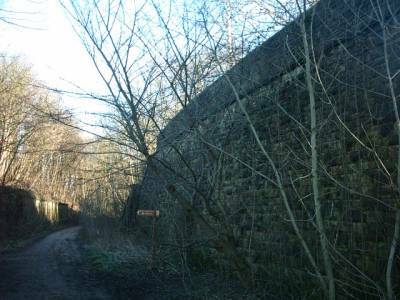 I think the station was demolished long before the motorway was built, however the line was still open to freight and when they built the motorway provision was made for the railway to continue running. 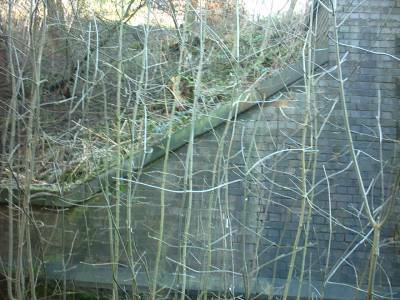 However one of the tunnels was damaged during the construction of the motorway, BR decided they could do without the route - and it was subsequently closed. Back to the surviving platform. This is a close up of the platform end (at the Woodley end of the route). Notice how mother nature has taken over. Another shot of the start of the platform. Notice how the tree has caused the platform edge to move. How long will it take before it get pushed off completely?? The end of the station – looking towards Bredbury and Woodley. The bridge has long since been removed. As you can see – all of the old viaducts and bridges have been removed. The last embankment in this area has recently gone. Just out of the shot, a large Tesco has been built, to make way for the car park, the old stone tipping yard was demolished along with the embankment where the line ran. By the way, it was a long drop down to the River Tame below! 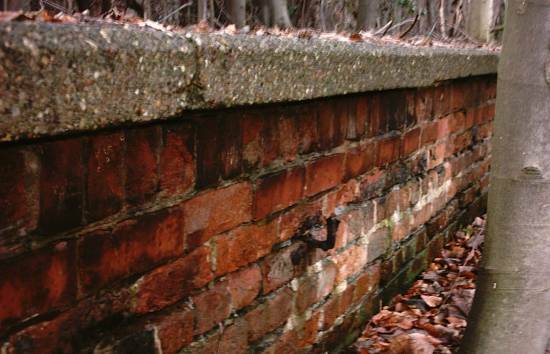 One of the abutments. Looking towards Lancashire Hill. I don't know when the bridge and other viaducts were demolished. But I do remember them as a child, when my dad drove me along the motorway on trips out. All of the abutments in their full glory! The M60 runs at the top of the picture. 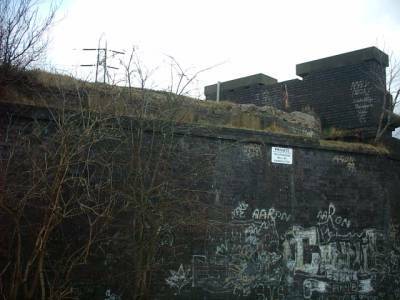 The entrance to the old tunnel – looking towards Heaton Mersey / Wellington road. I didn't’t go in the first part – it looked like kids had been using it as a den, and it didn't’t look very welcoming. 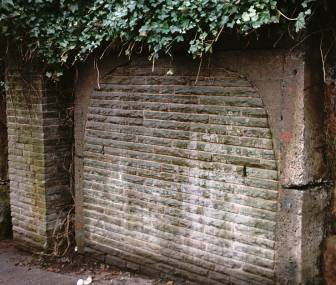 The first part is under Lancashire Hill, the original tunnel is about 6 meters further along. What is left of it – I don’t know. I bet it has been filled in for safety reasons. Another shot of the top of the tunnel. 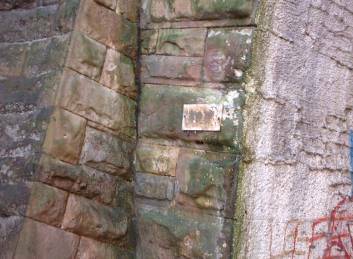 The tunnel runs through sandstone (which is found in large quantities in Stockport). I always found this site very fascinating. It looks like the new road (Lancashire Hill) was designed around the railway. 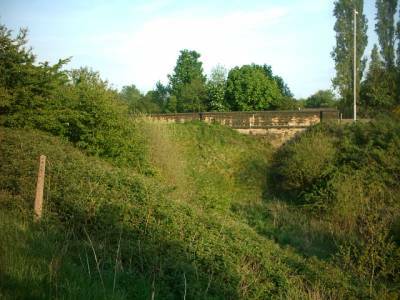 Taken from Lancashire Hill – you can see the curved brickwork that forms the top of the tunnel. A little bit blurred, but this is a shot of the station site taken from Lancashire Hill. I think this is an old air raid shelter. There are a lot of these around Stockport – the main ones have been re-opened as a museum by the local council. I hope you have enjoyed looking at these pictures of the old station site. I find it fascinating what is left and also to think about what railways we used to have. I look forward to looking at this route in more detail, and adding in information about where you can ride your bike along it. 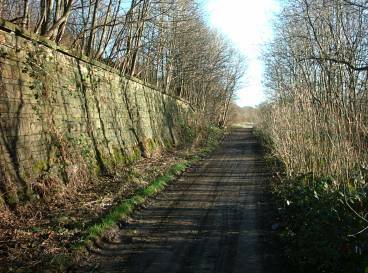 Pictures from the original railway alignment running towards Bredbury. Updated January 23rd. 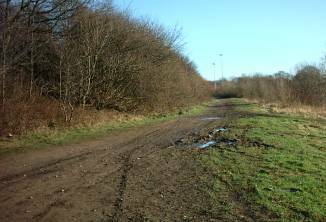 On a Sunny but cold Sunday afternoon I decided to take a look at the old railway line that used to run from Stockport to Bredbury and also off to Manchester via Reddish Vale.  I am working on this route as part of the bike ride pages on this site. 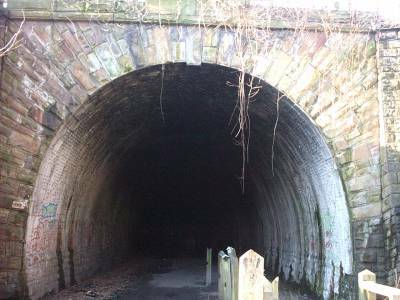 However I wanted to have a close look at what is left of the original alignment, specifically the Brinnington Tunnel which has been restored. I left the bike at home for this one, but brought some sturdy boots as I knew the going would be a little soft. 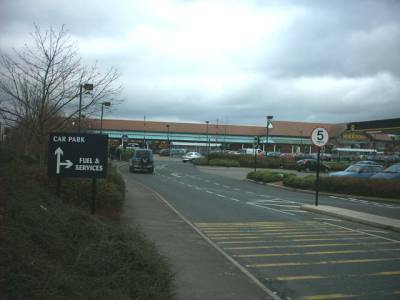 I started off by parking in the car park just off Tiviot way in Stockport (near the new Tesco). The way on at Tiviot Way - I walked up the embankment on the right. 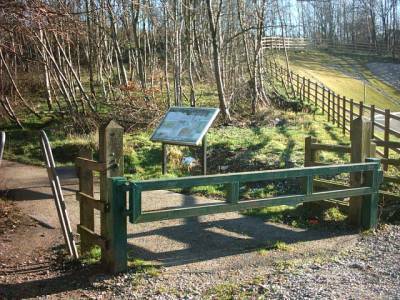 The fence at the top right hand side is the route of the original railway alignment. I walked up the side of the embankment towards the original railway alignment. This is the view half way up, Tiviot Way runs left to right. 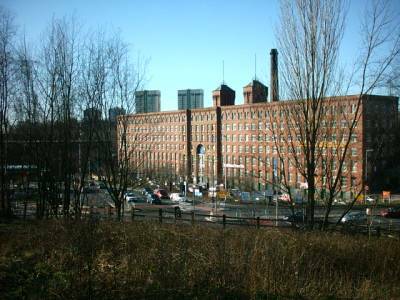 This is the big mill just opposite Tesco. You can also see Lancashire Hill flats above that. This is the view from the railway alignment at the top of the embankment. 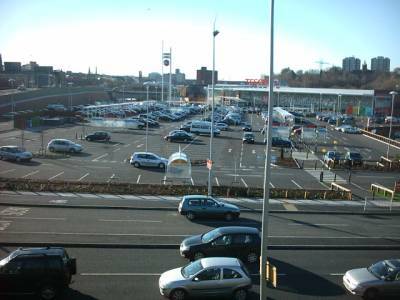 The view is now taken up by the new Tesco store, that was built late 2004. 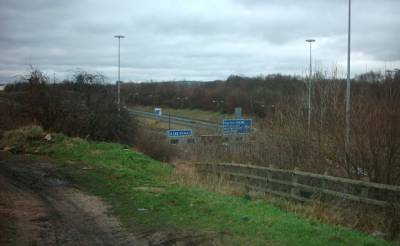 The original alignment was tight to the M60 motorway on the left hand side of the picture. A bridge was here, across Tiviot way below. Just over this bridge was a stone loading / drop off yard. This was still in situ and derelict a few months ago. I had taken a closer look a few years back and it was fascinating. Shame I didn't get any pictures. 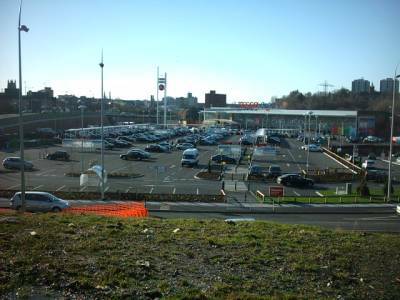 When Tesco was built all of the this yard and the embankment was demolished to make way for the car park. Another view of Tesco - this is a little clearer showing the original alignment on the left - parallel with the M60 motorway. 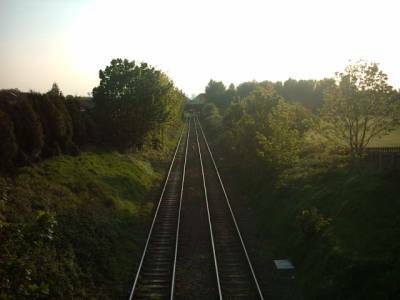 The line curved round to Tiviot Dale station. It used a selection of arches and bridges to do this. These have all now been removed. On disused railway lines, you don't find a lot of original infrastructure left, lots of the bits that were worth money were recovered for scrap, however you do sometimes come across objects. 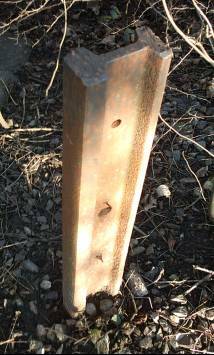 This is a post from the original fence that marked the railway property. The wire fence has long since gone. Another piece of original equipment that caught my eye. I nearly tripped over this! I think it is part of the signaling equipment. The wires that controlled the points and signals went through these pulleys (that were placed along the track) It looks like there were at least five signals or points along this line. 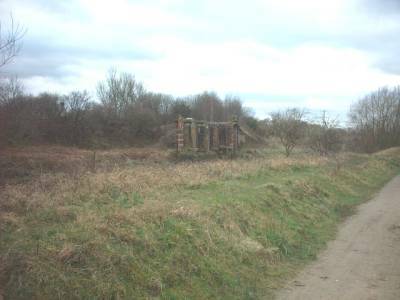 I also know there used to be a signal box along this part of the route, not far from where this picture was taken. Here is the view towards Bredbury, with my back towards Tiviot Way. The original alignment is clear, with just a few new saplings growing on the sides of the line. A lot of the original ballast survives on this section. 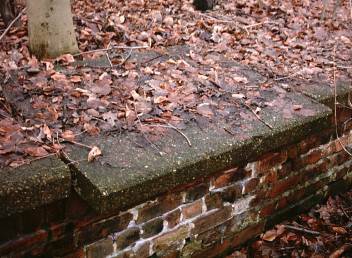 Along this part of the line there were numerous original sleepers still in place. These are concrete ones. I am not a railway historian but I think these came in later on in the 60s. 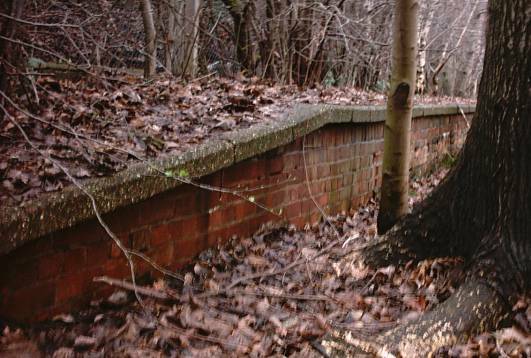 This line shut around the 1980s, so these concrete sleepers may be quite young. Another sleeper. You can also see the bolts on each end where the rail was fixed. We are facing towards Bredbury. The line splits a little further on. To the right towards Bredbury, Woodley and Romiley. To the left through Reddish Vale and on to the still open Sheffield Hope Valley line towards Manchester. 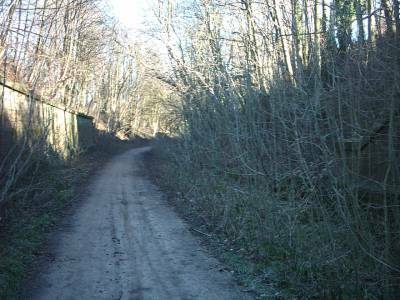 The alignment was converted in to a cycle path and walk way in the mid 80s, and is great way to see the Reddish Vale area, and get away from traffic. I am going to cover the bike route in more detail soon. Approaching Brinnington Tunnel. This is where the line split. To the left the line went off towards Manchester. 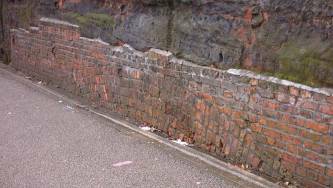 A close up of the original brickwork in this cutting. Originally this was also a tunnel, but it was all cleared and made in to a deep cutting. 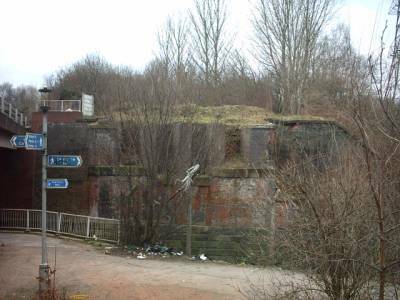 The Brinnington tunnel. The line continues to climb at this stage and also bears round to the right. 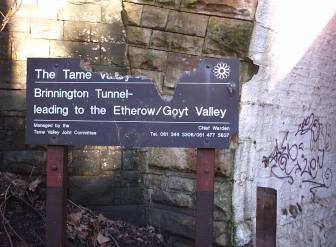 The Tame Valley sign at the tunnel entrance. The tunnel was restored and reopened in 1990. Just inside the tunnel there is an information board, explaining about its use and showing an original map of the railways in this area. Unfortunately this board is heavily vandalised. Inside the tunnel. This is about half way through. Its on a slight curve, but you can see daylight at each end. The going is good here, but there are drips of water from above. 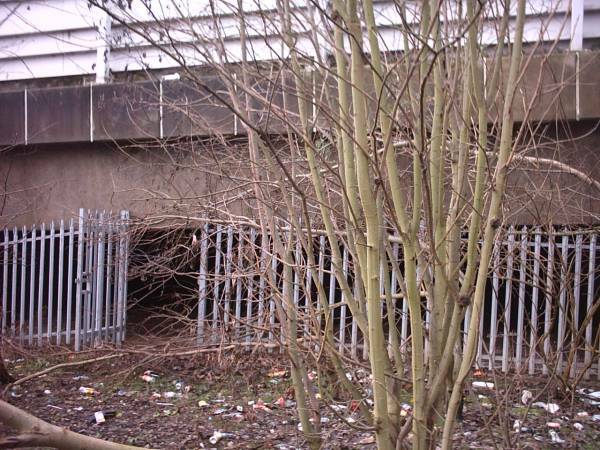 If you don't fancy taking the tunnel, you can go over it and walk across the busy Brinnington road above. At the other end. You can see the inside has been painted white to try and get more light. A close up of the tunnel. The sign originally read 103 - a BR branding?? Looking back to the tunnel - To the left of the picture there is a long stretch of concrete sleepers still in the ground. They must have not been able to remove these when they took the rails up. I have my back to the tunnel. The line climbed up towards Bredbury. 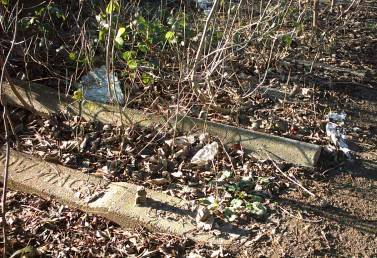 A close up of the original concrete railway sleepers still in situ near the tunnel. A close up of the one of the bolts that used to hold the rail down. The view further on looking towards Bredbury. 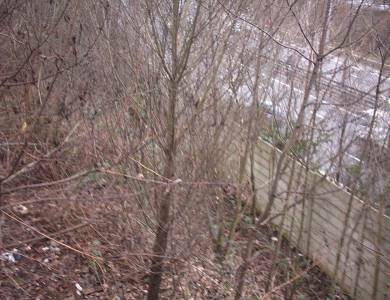 The M60 runs to the right of the picture and now severs the original line just at the top of the picture. The line then ran at the back of Woodley, some of this line is still in use as a branch off to the recycling plant in Bredbury industrial estate. I spotted this near where I took the picture above. It is an original rail now being used a crude fence. 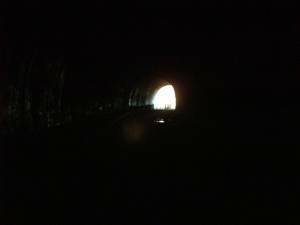 I re-traced my steps through the tunnel, and took the alignment towards Manchester (through Reddish Vale). I came across this bridge across a culvert. 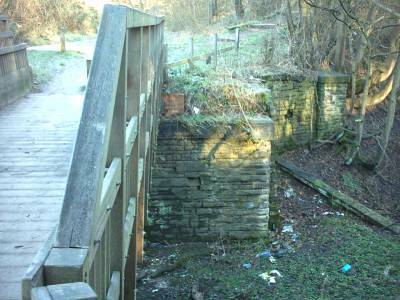 The original bridge has long since been removed, and replaced with a smaller footbridge. The other side of the bridge, again you can see the original part of the bridge. Another interesting look at this line. Again I hope to continue this page by looking at the line further on (Near Reddish and Woodley) also the other direction near Heaton Moor / Didsbury. Its a shame the line is still not in use, however its good to see the alignment in use as a pathway. 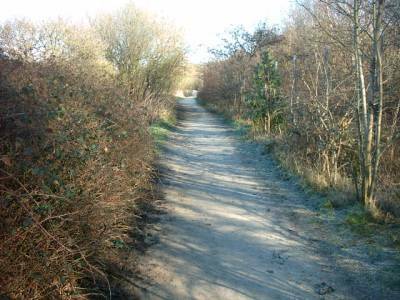 The pathway goes through some lovely green belt land. Even though you are never far from civilisation, you do feel like you are out in the country. I hope to cover the bike route in more detail soon. Keep your eye on the site for updates. On the last Sunday in January, myself and Duncan took a cycle ride along the deadline. We needed some pictures for the cycle route web page. I thought I would get a few more pictures of the original alignment. We looked at the Bredbury and Heaton Moor end. 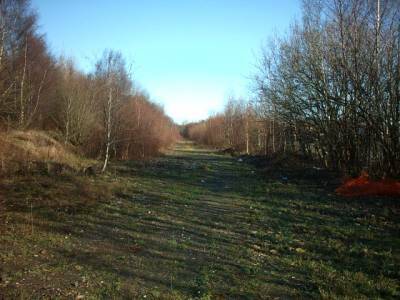 The end of the line (in its present state). The alignment used to carry straight on (the M60 wasn't built then) towards Bredbury and Woodley. The alignment originally ran where the middle light is. Taken from Ashton road (near Morrisons in Bredbury). This is looking back towards Stockport and from where I took the picture above. You cant see too much of the line in this photo, as Mother nature has taken it back. 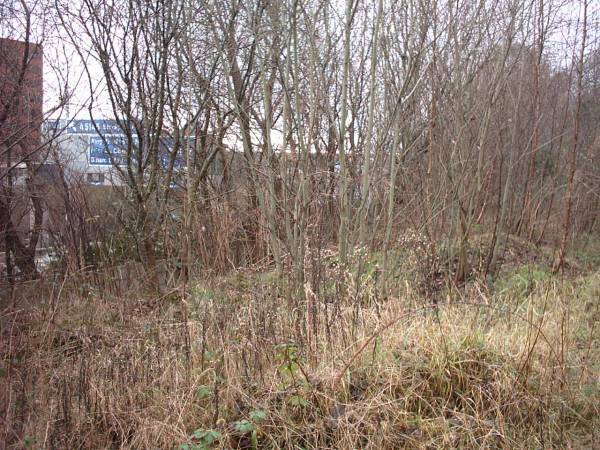 Even in Winter the undergrowth is dense. 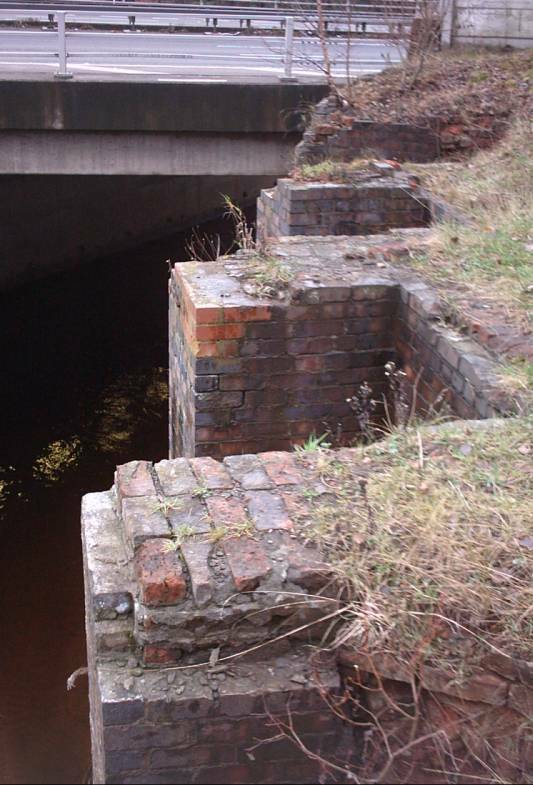 The original brickwork from the bridge is still there (you can see this on the picture) - but the bridge has been filled. The only clue is he alignment of the trees, this shows the route. 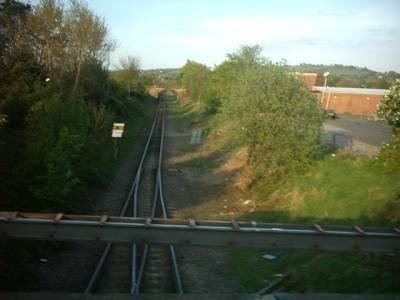 This is the view of the original alignment looking towards Woodley. As you can see the alignment has been filled in completely here. However just past the supermarket the line exsists. It is used a branch to the Recycling plant in Bredbury industrial estate. We took a ride back in to Stockport and followed the line. Much of the alignment is lost or has been filled in. We also took a safe route through Stockport away from the main roads. 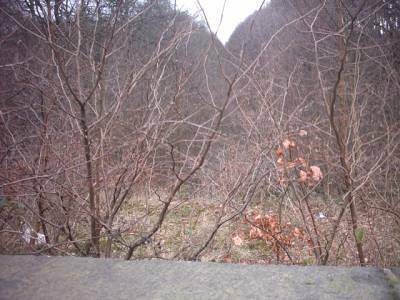 This picture is looking up to the Tiviot Dale station site. This is at Haeton Mersey, down by the Mersey river. At this point the line split. There was a spur off to Manchester, via Didsbury and Chorlton (back to the Fallowfield Loop) and this view, where the line crossed the Mersey and headed off to Northenden (and eventually Warrington). The line is still in use on the other side of the Mersey. Its freight only and runs across the M60 through the old Cheadle Heath Station. 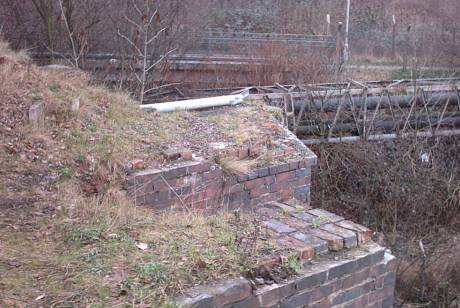 This is a shot of the bridge abutment that carried the line across the Mersey, from Manchester to Cheadle Heath, Buxton and on to London. This is all that's left of once a fine bridge. There is no sign of anything on the other side of the Mersey. Its hard to believe that this line once had regular express trains from Manchester to London. I think it was last used for this purpose when BR was electrifying the West coast main line, and they diverted trains on this route. Again - I hope you have enjoyed these recent pictures. I would like to get some more pictures of the line, as is it now, running back towards Manchester. 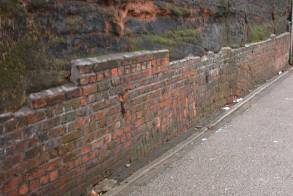 A lot of it has been converted in to pathways / cycle ways, however a lot has been lost to development. The part of the line from Chorlton to Stockport (via Heaton Mersey) is planned to be used for the Stockport Metrolink extension. Funds are very tight for this scheme and it looks unlikely this will happen soon. Updated Pictures (15th May) of the Line as it is "Today" near Woodley and Bredbury. This is the view of the line today just behind Woodley precinct. I am standing on the bridge that carries Mill lane over the railway. At this point the line splits to double - this is to allow movement of the freight rains that use the recycling plant at Bredbury. Further on it joins the line to Manchester (via Hyde). Good timing - from a smaller footbridge behind Rodney Drive, I got this picture of a freight train ready to depart from the recycling plant. I'm not too sure what class of engine it is. Looking back From Mill lane back to the recycling plant. Its good to see some of the line still in use and it is keeping many tons of waste being transferred by road. 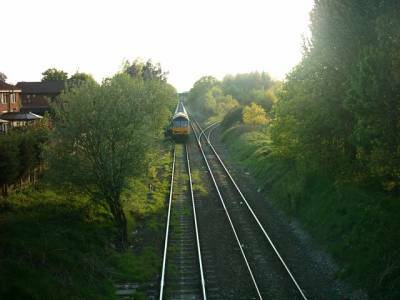 This was taken near Bredbury station. 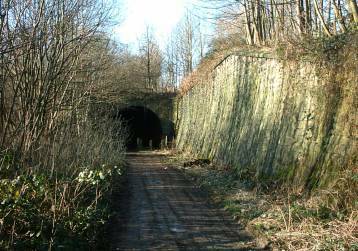 Here the line from Stockport ran under Hyde road through a small tunnel and ran parallel with the Hope valley line, until it eventually joined this line once it was at the same level. The tunnel has been completely filled in, however the cutting before it still exsists.